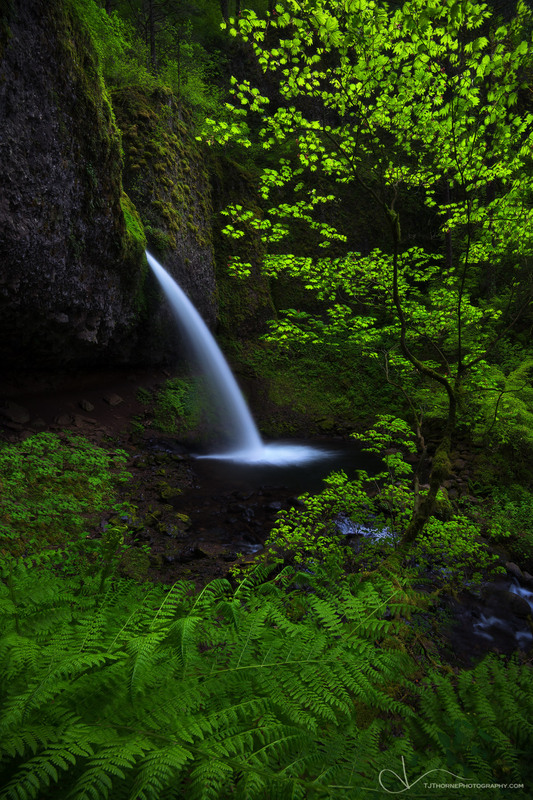 Spring ferns and leaves frame Ponytail Falls in the Columbia River Gorge, Oregon. With all of the hiking I’ve done in the Columbia River Gorge, I have walked past Ponytail Falls more than any other waterfall. It’s not a far jaunt up the trail from Horsetail Falls, the roadside waterfall that causes traffic jams as visitors stop their vehicles in the middle of the road, arms hanging out of the window to get a snapshot before continuing on, and there’s no doubt that in the past five years the visitation to this falls has dramatically increased leaving little opportunity for solitude. But it’s always been one of my favorites. When I first started exploring the gorge, my go-to hike was Triple Falls. I’d start at the Horsetail Falls trailhead, head past Ponytail Falls, Oneonta Falls, and scramble down to Middle Oneonta Falls. From there I would continue on to Triple Falls, crossing the bridge upstream where I would have lunch in what was, at the time, a place that I considered to be one of the greenest, most fairytale places I’d ever seen. A gentle creek offered a calming soundtrack while I sat on mossy logs and and soaked it all in. It astounded me that I lived in a place where I could walk past five waterfalls in just over a five mile hike. I was in heaven! The trail even went behind Ponytail Falls which was a pretty big deal to this east coast kid. As my hiking experience grew, the Russ Jolley Trail and the Rock of Ages Trail were my go-to hikes, which also took me past Ponytail Falls before I would scramble up either side of the creek on the steep user trails, disappearing from the crowds to get my physical, mental, and emotional exercise. When I was battling alcoholism I did those hikes several times a week. Being that they were so close and not all that long (2-4 miles each) meant that I could whisk myself away into an enchanted world where I knew that I was safe, a place that I knew everything made sense and had order. I’d find strength in those forests. I’d find life. It’s hard to swallow sometimes, knowing that those user trails, forests, mosses, branches, rocks, and everything else that made the gorge wonderful and unique have likely been lost in the Eagle Creek Fire, or they have at least been greatly altered in a way that just won’t be the same to me. I know that the gorge is still a special place and that it will heal itself with little regard to my feelings on the matter. Nature does what it does. Yet I can’t help but hold those memories dear in the deepest recesses of my soul. I will cherish them until the day I die and when I think back upon them I will see this view of Ponytail Falls and envision turning this corner on the trail to head behind the water, knowing that serenity was well on its way.